White worms are an excellent live food for fish and are very easy to raise. White worms are white in colour and they reach up to 1½ inch in length. 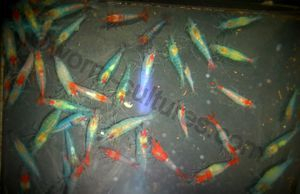 White worms are great for conditioning fish for breeding. They are eaten by most fish and are suitable for a wide range of fish since their size is appropriate even for the smallest fish. They should however be fed as part of a varied diet since some sources consider them to be excessively fatty. The food should be placed in the centre of the container on the surface. Don't feed again until the worms have eaten all the food. If the food goes mouldy, just spoon it out and add fresh food, but not so much this time. White Worms like it fairly dark and will start to dig back into the dirt once the lid is removed, so it is best to gather all the worms you need as soon as you open the lid, and put them in a small container, and then take your time dropping the worms into the tank. For maintenance add more food when the worms have eaten the last of the food you put in, and add more water if the soil starts to dry. Worm cultures are fairly hardy and can survive weeks, possibly months of neglect (as long as the don't dry out). Although they may need care and feed before you will able to harvest enough to feed your fish again. They thrive at a temperature of up to 21C (70F).